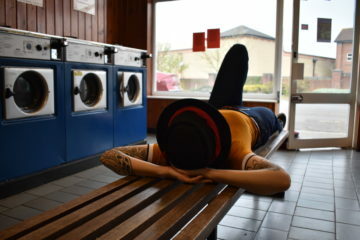 The Stockholm duo Vulkano left their first calling card last year, the synthy post-punk single ‘Vision Trick’, a song that seemed, musically, more hipster than riot grrrl, despite the copy in the band’s press releases. Their debut album, Live Wild Die Free, is released on 3 February and is a confection of post-punk, synth-pop and stroppiness that reveals a lot of talent and imagination, but also some disappointments. Vulkano are Lisa Pyk-Wirström on keyboards and percussion and Cissi Efraimsson on drums and lead vocals. Paul Lester hails them as Altered Images circa ‘Dead Popstars‘ (i.e. the short lived Banshees period) but I see them as two women with excellent taste, who’ve been let loose in a musical equivalent of the proverbial sweet shop and are at ease mixing their Gang Gang Dance with their Slits, B52’s, CSS and Icona Pop. Pins spring to mind as a group with more swagger, drawing as they do on Brooklyn punk and a CBGB music club vibe, but Vulkano are possibly more subversive, in that you can see them popping up on both the NME tour and Children’s BBC, much like a modern day Voice of the Beehive, perhaps. Album highlights include the excellent ‘Choir of Wolves’, which opens with the women howling like wolves and also features robotic keyboard riffs, echoing vocals and menacing guitars. There is something akin to Angela Carter’s subversive fairytales in the subject matter while, musically, the album’s mix of tempos is reminiscent of the aforementioned Slits and CSS. The video has the band chewing away on raw meat while dressed in (I hope) fake fur and Strawberry Switchblade ‘esque eye makeup. It evokes the music scene of the early to mid-1980s, but still has the makings of a future classic. Similarly, the modern, feminist psychodrama of ‘Too Young To Die’, which opens with the fuzzy guitar of a computer game theme tune, quickly takes a more sinister turn. This is a song about being followed home. 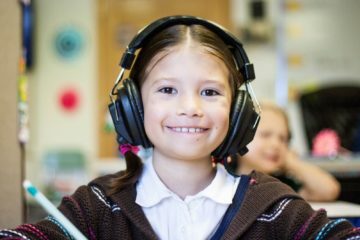 Our heroine is concentrating on keeping moving and getting herself home, while pleading, “Don’t kill, please don’t kill me, I’m too young to die.” Musically, it’s a new twist on a type of bravado that has its roots in 1960s garage rock and 1950s rock’n’roll. Lyrically, it is a more straightforward sister to Bikini Kill’s ‘I Hate Danger‘. The strummy electric guitar of ‘Vulkano’ showcases a slower, more pared down side to the band. It’s a song about not being pushed about and is funny and stroppy, with a definite streak of determination. It is two parts Bikini Kill’s ‘Rebel Girl‘, two parts Thee Headcoatees’ ‘Headcoat Girl‘ and two parts Lulu’s ‘I’m A Tiger‘. They could do a lot with this side of their music if they choose to pursue it. The album opener, ‘Trolls’, seems to be concerned with the evils of internet trolling and is set off by a tune that would sound very like early Slits had the band obtained and deployed synths in 1977, rather than sticking to guitar, bass and drums. By contrast, the single ‘Vision Trick’ is more goth than grunge and more post-punk than punk, with nods to Altered Images and Gang Gang Dance, along with overtones of vampires and general eeriness. But it’s not all as genius as this. There are some so-so moments: ‘We Ride’ sounds like a B52’s B-side and is somewhat underwhelming. ‘Spider Spider’ seems a tad bland (despite its erratic rhythms and yelping) and the otherwise interesting ‘Jungle’ just goes on for too long, which is a shame because it’s about a girl who eats hallucinogenic mushrooms and has the horrors, and there just aren’t enough ecologically themed acid punk tales out there. The album closes with ‘Psycho Girl’, which touches on a common mental health trope in its title and seems to be somewhat at odds with the rest of the album, from a lyrical point of view. It’s a horror story in every sense, a new ‘Rip Her To Shreds‘ without the panache or charm. Musically, it’s the equivalent of Kathleen Hanna composing a score for another straight-to-video Poison Ivy follow-up. For better or worse, Vulkano’s musical influences seem to nod towards a new wave of riot grrrl. Last year, after a talk about Riot Grrrl in Birmingham as part of the 33 Revolutions series of events at Vivid Projects, I spoke to a number of women who could be described as fourth wave riot grrrls. They told me about modern-day riot grrrl activities in their city, with its history of feminist punk, and also mentioned the effect Slutwalk had on re-galvanising the movement. Perhaps we shouldn’t be calling these communities riot grrrl communities anymore; perhaps we should be calling them by some new name. But there is no new name for them yet; it is the movement with no name. Vulkano’s style, sound and overall attitude hints that they could yet become the heroines of this movement with no name, but they could also become the next Icona Pop. They could go either way and, at the moment, that is part of what makes them so interesting. 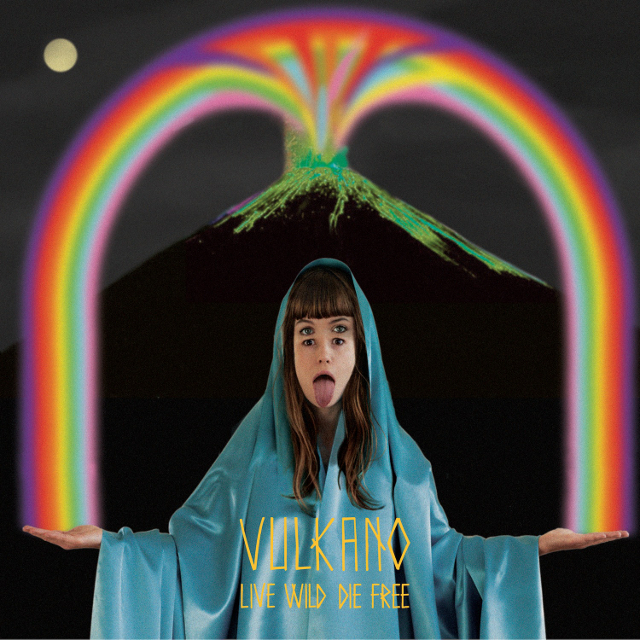 Cover of Vulcano’s Live Wild Die Free. This shows a night sky at the top with a small moon (top left) and a large green-topped volcano (middle) erupting a rainbow lava arc that falls to the left and right (bottom) into the hands of a figure in a light blue silk or satin hooded robe, who appears to be an amalgamation of Lisa Pyk-Wirström and Cissi Efraimsson (fringe/forehead/eyes and eyes, nose and mouth). Band name and title in thin yellow font. Vulkano’s ‘Choir of Wolves’. The video begins with five figures in silhouette in the darkness. They have wolf ears and long hair and this shot corresponds with the wolf howls that open the song. We glimpse fragments of female-looking? faces and hair. It is evidently cold, as we can see their breath in the air. Cut to daytime and shots of (fake?) fur coats, hair, what looks like a tattoo on a hand and girls with white faces and heavy black eyeliner. A longer shot reveals a mound of five girls huddled up together in a heap, like a pack of wolves. Cut to clearly homemade landscape featuring a blue tent roof as the sky, a homemade volcano, cut out cacti and similar desert markers, including a sheep’s skull in the foreground (clarification needed? desert marker is usually a steer’s skull – no sheep in the desert!). The homemade sun goes down in the sky and the video cuts to the wolf girls eating raw meat, suspiciously guarding their meat from each other and howling at the moon. Fire erupts from the volcano and the band perform in the dark. The mound burns as the band play, then the wolf girls do some regimented 1980s-style dancing. The video ends in a mish mash of flying hair, dancing girls and headbanging musicians in the dark, amidst the smoke and flames.